The CITES Convention held recently in South Africa, has come to an end (Convention of International Trade in Endangered Species). CITES like the law has good intentions but it is man made and hence flawed. Botswana who has the most elephants of any African country and the best President in the world, were motivating with Kenya, for elephants to be uplifted to Appendix I. This, if achieved, would spell the end of the trade in ivory world wide. Kenya supported Botswana, but South Africa, Namibia and Zimbabwe opposed it. The European Union, USA, Canada, Russia, China, Norway, Korea and Japan also opposed the motivation to Appendix 1 and so elephants were left on Appendix 2. Ivory can continue to be traded. A sad day for elephants indeed. 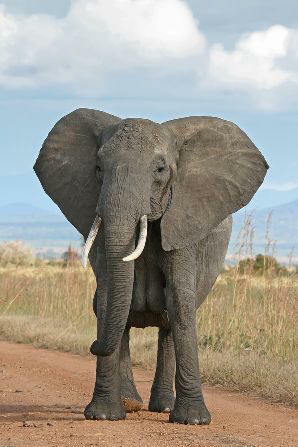 What I can't understand is how can countries with no elephants affect the vote of the African elephant. Surely African leaders and African people should be responsible for their elephant populations and outsiders should not be allowed to affect the vote. 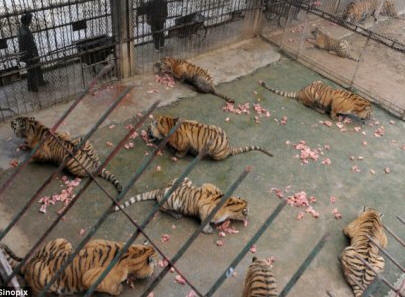 The CITES decision to close Tiger Farms in China is to be applauded. However, there can be serious repercussions to this decision. If China does close the Tiger Farms (The Chinese Government is heavily invested in some of the larger tiger farms) then some 6000 tigers on 200 farms will be destroyed. It is these tigers that supply the lucrative body parts trade in China. Once this population is gone, the pressure will then fall on the remaining wild tigers (about 2 500 in the wild) to supply the body parts trade. Another source of body parts will be the 8 000 captive lions in South Africa. It is well known that when a lion is shot in a canned hunt, the body parts are shipped via Pretoria or Durban to China. Once they arrive in China, they are relabeled tiger body parts and no one is any the wiser. My question is if CITES has the power to close the tiger farms, then why didn't they close the captive lion farms in South Africa? The only explanation is that the South African Government has no desire to close this cancerous industry. This was a golden opportunity. It's a sad day for the thousands of lions pacing up and down in dingy cages across South Africa. Therefore the South African Government's non support of elephants to Appendix 1 and their non support of closing the lion farms in South Africa, sends out a strong and disturbing message world wide. We are more interested in money. We are more interested in trading wild animal parts. I suggest this is against world trends. In my opinion South Africa has gone from leader to follower and a dismal follower at that. It is no coincidence that two weeks ago South Africa was voted the most corrupt country in the world. The illegal trade in wild life products ranks fourth behind drugs, arms and human trafficking. Corruption and the illegal trade in wild life products are bedfellows, they are vital to each other's success. While President Ian Khama has successfully combated poaching by using his army and introduced rhino into Botswana, South Africa has floundered by losing more than 5000 rhinos in the last 5 years. However, forget about CITES, forget about rules and regulations and the mountains of documents and permits, forged or legal, circulating the globe every day. Forget about the bureaucrats trying to juggle the complex rules and regulations of CITES. The truth is elephants, lions and tigers compete with human beings. Lions and tigers eat our domestic stock, elephants destroy our crops and eat the grass which could be eaten by our cows. They are competitors for space, food and water. As human beings we can no longer tolerate this competition. Our population is approaching 10 billion, we need this space to grow food for ourselves. This in a nutshell, is where the game will be played and won or lost. 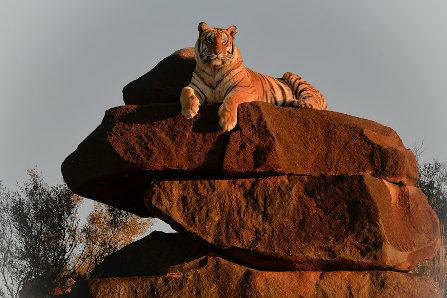 When I started my tiger project in the year of 2 000, there were 8 000 wild tigers and 40 000 in captivity. 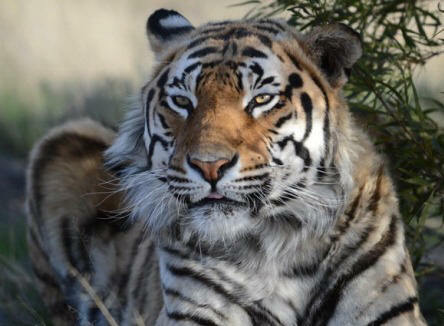 Today there are about 2 500 wild tigers and 80 000 in captivity. It does not take rocket science to work out what the end result will be. Under Rodney Drew and Sheldon Nyce's guidance, the lodge is moving forward at pace. We hope to be open for booking on the 1st of January 2017. 6 Beds are available with bathroom en-suite. There are two extra children's beds. 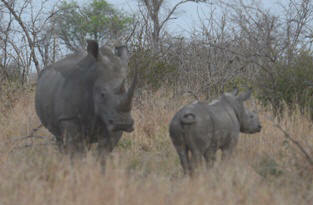 Some years ago we observed two young males, Mahindra and Sundaban, form a coalition. We are observing the same behavior with two young females, Jameez and Oria. 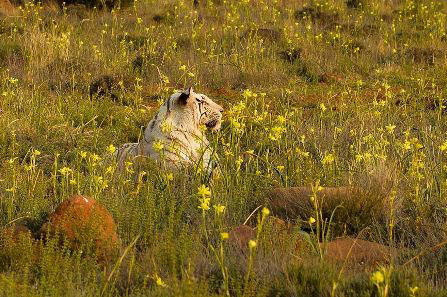 Jameez is the surviving cub of Ussuri’s litter fathered by Sariska. Oria is the surviving cub of Shadows second litter fathered by Seatao. Although not as gregarious as lions, tigers will do anything to help ensure their survival. Obviously for hunting and defense purposes, Jameez and Oria find it better to form a coalition than remain on their own. Once they become territorial females this coalition will dissolve and they will become aggressive towards each other. The early rains have caused Tiger Canyons to become covered in beautiful flowers. Tigers and cheetah moving through the flowers and blue cranes doing their mating dance are providing spectacular photo opportunities.